It was only a dusting, but this weekend saw our first snow of the season. For little E it was in fact the first snow ever. So sweet to see her cute face when we woke up to a blanket of white. This excitement was spurred on by her big sister who exclaimed that we must put all the decorations back up, ‘it’s Christmas again!’ Up until last weekend we were barely wearing coats. Finally we can get out the wellies, raincoats and bobble hats. Perfect timing that we got a special delivery from Hatley then. Hatley is a Canadian brand that is available online and found in stores such as John Lewis. 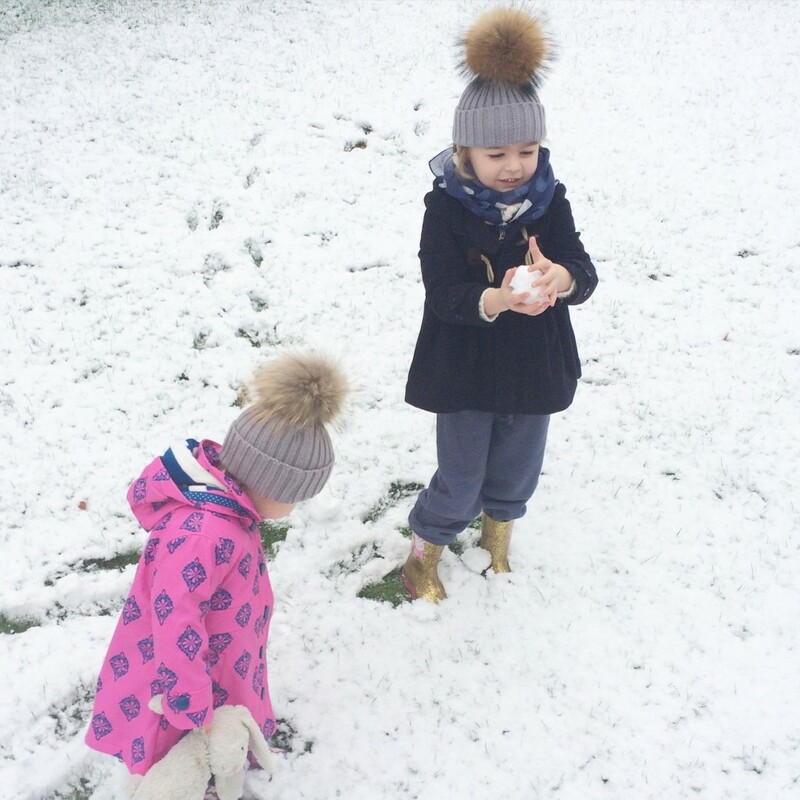 They specialise in fun and practical outerwear designs, as well as an extensive range of baby, children’s wear, homeware and accessories. There is actually way more to this family-run business than just those wellington boots. (I didn’t know that before now either.) Working closely with their PR I was lucky enough to receive some boots and a raincoat for E. I was actually already looking for something fun and stylish for her to wear to nursery, so their arrival (along with the snowfall) was perfect. 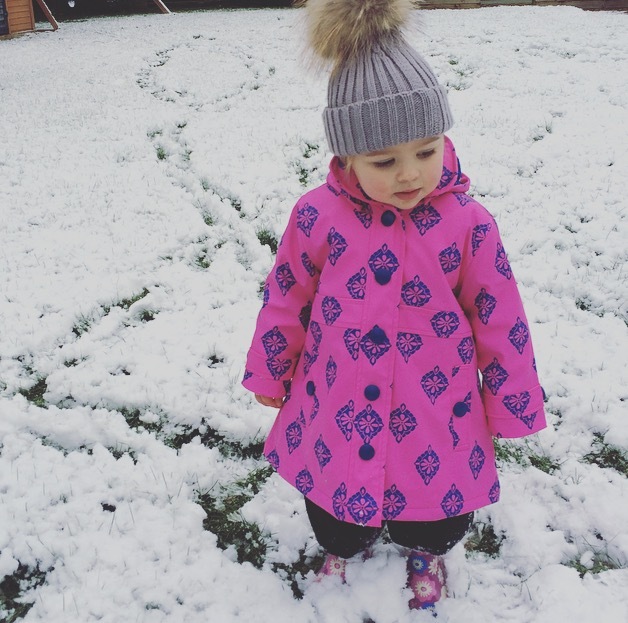 She started nursery a few weeks ago and I didn’t have anything suitable, that was warm and waterproof. I definitely didn’t want to send her in wearing her best tweed coat. 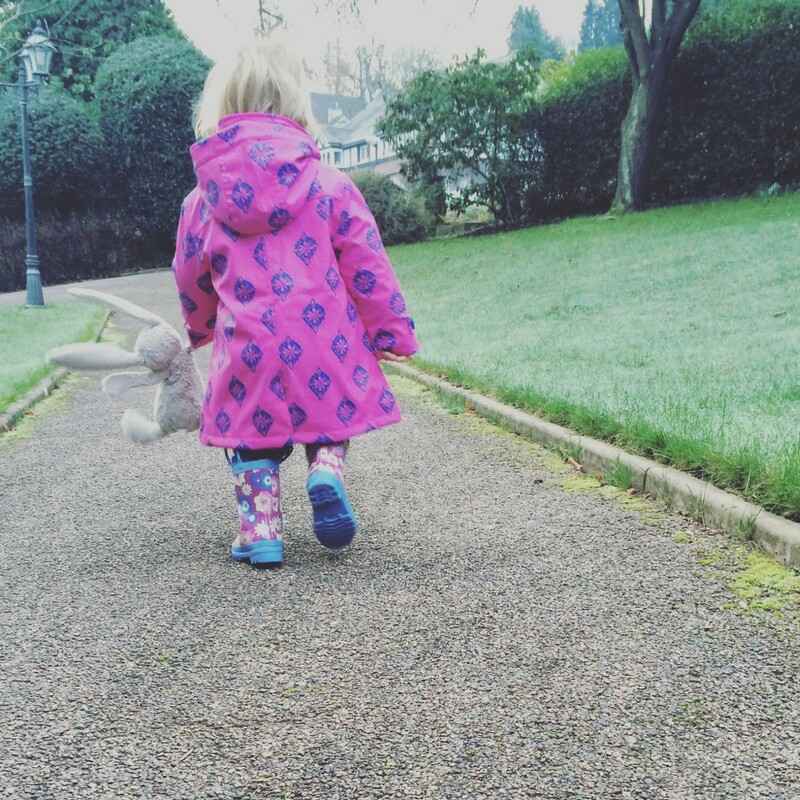 Their raincoat collection is perfect for messy days, playing outside in the wet. (And snow.) Fully lined in a soft and comfortable terry, coated in waterproof and washable Polyurethane (which is PVC free.) I just looked online, they also have some rather adorable matching umbrellas. As you know i’m not usually one for bright colours and bold designs, but I do think there is a time and place for everything. And where young children are concerned it’s imperative that a waterproof collection exists within their wardrobe. I love the sweet animal and bold floral designs, and the bright Fuscia is a welcome pop of colour to our otherwise dark and miserable early mornings right now. Raincoat aside, E also loves her wellies. They have been left by the front door on a number ofoccasions and before I know it she will put them on herself, thanks to the handy pull on straps, then come running through the house with a huge grin. I now have to remember to hide them away to prevent her from wanting to wear them with every outfit. Like I said, there is a time and a place. You can visit their website and shop online here.